Doctor Aphra #29 drops the Dr. Evazan and Ponda Baba audience in favor of Imperial P.R. and some locals on Milvayne. The switch up actually works well for the story. Now as Aphra and Triple Zero deal with the ticking time bomb and never ending escape from pursuers, they have the sympathetic audience of families and some guys at a bar, as well as the all watching eye of Imperial public relations. The new elements add some fun to the story that was lacking before hand. This issue opens with an introduction to Imperial P.R. on their propaganda flagship. It’s kind of a joke in itself, but it’s not unfounded as we’ve seen glimpses of this kind of spying equipment in Star Wars Rebels. It’s only natural that the Empire would have a P.R. department, and this comic takes a funny look at them. Meanwhile Aphra and Trip are being sentenced to death. With some quick thinking, they turn the tables on Tam Posla, and once again they’re on the run. The two of them have some nice dialog moments, run into Winloss and Nokk, and end the issue in a death defying plunge to their doom. While we know they’ll live, it’ll be interesting to see how they pull it off. 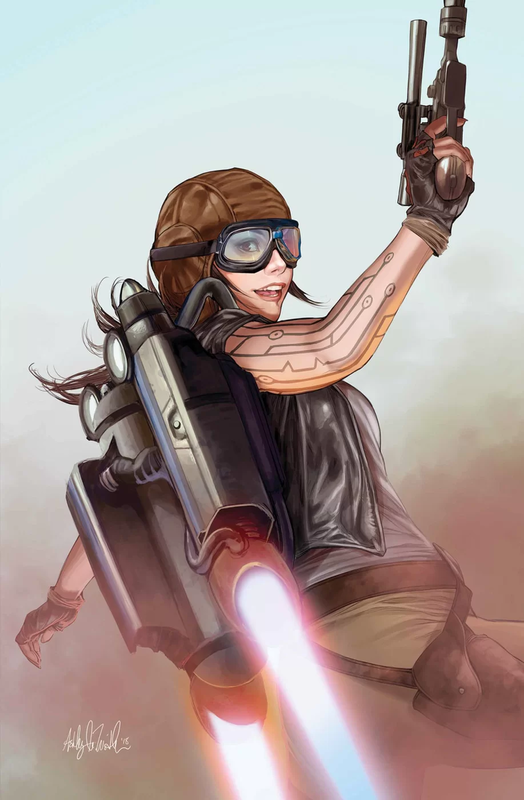 Worth noting, Aphra did not have a jet pack in this issue, unlike the cover. The artwork throughout the issue was great. From capturing the sympathetic onlookers watching the calamity of Aphra and Trip, to the chaotic action of all the running, chasing and exploding, the panels bring it all to life. Stand up job by the art team. With a fun story, fun writing, and great artwork, I give this issue a five out of five metal bikinis.